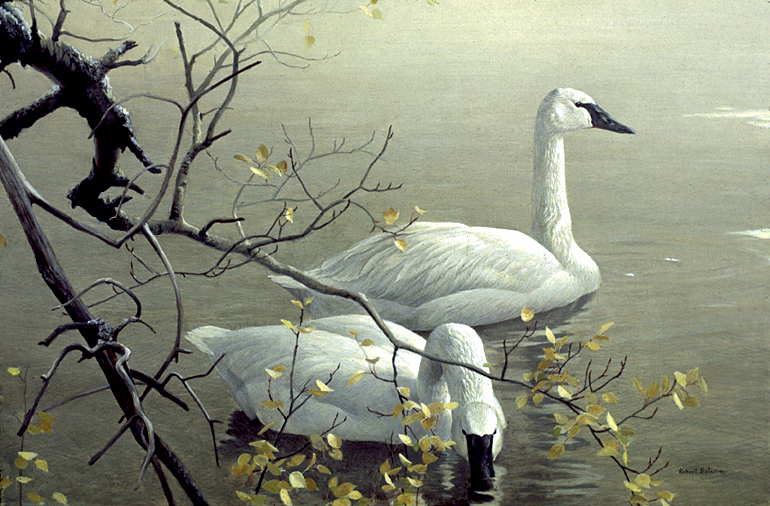 The trumpeter swan is the largest of our native swans. It is a bird of beautiful country in the west, and a bird which was brought to the brink of extinction. In fact, I did this painting for an endangered species exhibition in 1975. Since that time its recovery has been remarkable. It is one of the good news stories resulting from the efforts of environmentalists, conservationists and the general public in recent years. It is not all 'doom and gloom'. There are some positive trends, which encourage us to greater efforts on the other main tough problems facing our wildlife and environment.